Combine crepe batter ingredients in a large bowl and beat on medium speed with an electric mixer until ingredients are thoroughly mixed. Set aside in the refrigerator for 1 to 1 1/2 hours. Meanwhile, combine the ricotta cheese through sugar in a large bowl. Heat a large, non-stick skillet on medium-heat. Grease pan well with butter. Pour a small amount (about 1/4 cup) of the crepe batter onto the greased pan (note: the pan must be hot), titling the pan to allow batter to spread evenly. Brown lightly on each side (about 15-30 seconds per side; use a spatula to carefully peel away the crepe from the pan and flip – see this video for more information). Remove the crepe to a large plate, and repeat until the batter is used up. Spread about 1/3-1/2 cup of the filling on each crepe (except for about a 1 inch edge around the crepe), and roll up, completely enclosing the filling. 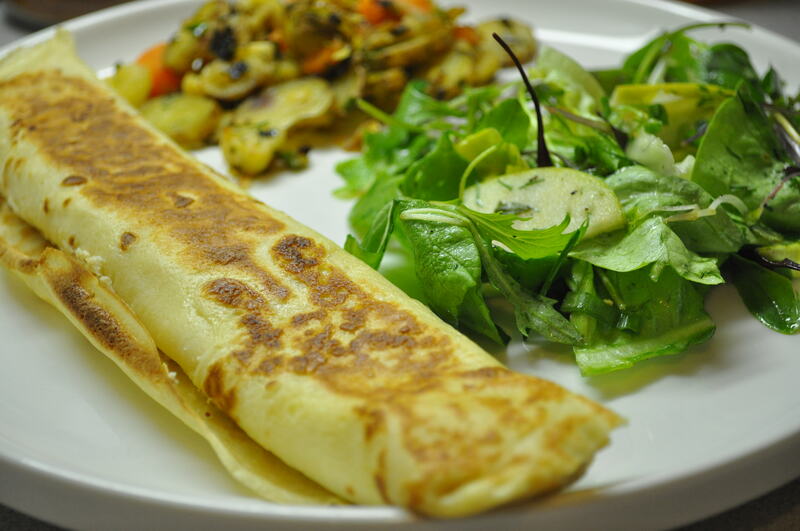 Melt about 1 tbsp of butter in the skillet, and lightly brown the outside of each rolled up crepe. Garnish with sour cream and serve. Preheat oven to 325 degrees F. Season raw chicken with salt and pepper, on both sides. Dredge chicken in flour, shaking off excess. In a large skillet over medium heat, warm oil. Add the chicken in batches and cook for 3-4 minutes on each side, or until lightly browned. Transfer chicken to a plate, and set aside. 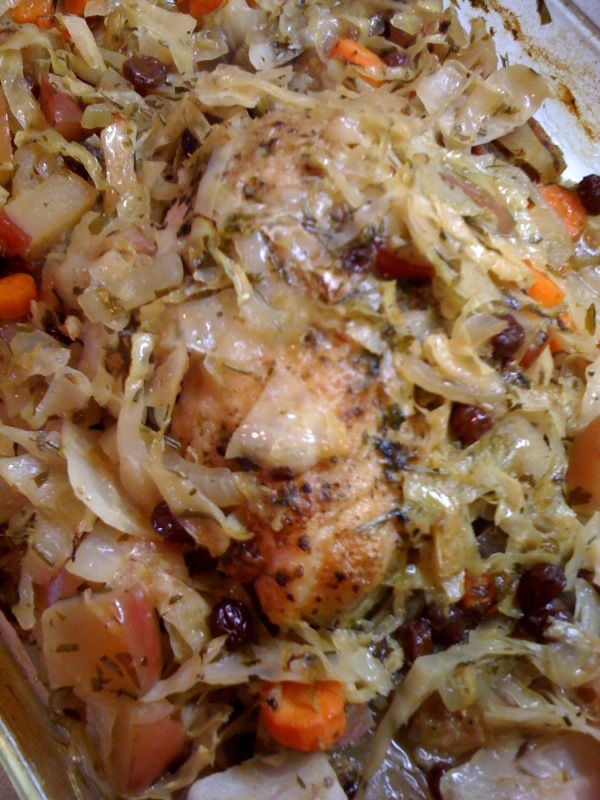 In a large ovenproof baking dish, combine garlic through cabbage. Toss with 3 tbsp extra virgin olive oil. Add chicken pieces, covering with vegetables. Pour the chicken stock and cider over meat and vegetables. Cover with foil and bake for 1 1/4 to 1 1/2 hours, or until chicken is tender. Very flavorful and colorful side dish. Turn oven temperature to 400 °. Cut squash in half lengthwise; discard seeds. Place squash halves cut side down in a 13×9-inch baking dish. Add water to measure 1/2-inch deep. Bake at 400 ° for 45 minutes. Turn squash over; bake an additional 15 minutes or until tender; cool. Scrape inside of squash with a fork to remove strands to measure 6 cups. Keep warm. In a large skillet, add EVOO and turn heat to medium-high. Add garlic and onion and cook, stirring, until golden, about 1 minute. Add sliced peppers and okra. Cook until almost done. Add undrained can of tomatoes and rinsed and chopped swiss chard. Cook until swiss chard is wilted and stem pieces are tender (about 3-5 minutes). Stir in spices and salt and remove from heat. Carefully halve squash lengthwise (it will give off steam) and remove and discard seeds. Working over a bowl, scrape squash flesh with a fork, loosening and separating strands as you remove it from skin. Toss with onion/garlic/spice mixture, fresh herbs, raisins and pine nuts.